Modern software applications are designed in a way to inform the user at any time about their state. For example, if an application is stuck somewhere, it will most likely display a corresponding indication (ie a progress bar or a loading ring). Usually, this is done by dividing the logic of the application into two (or more) threads. The main thread is always responsible for the UI of the application, since it displays or hides all the progress indications, while the other threads perform their logic in the “background”. Since the main thread in software applications is responsible for the UI, you can imagine that the main thread inside Unreal Engine 4 is the one responsible for the rendering. From this point on, we will refer to it as the game thread. If you try to perform heavy operations inside the game thread, you will most likely experience a game freeze (depending on your PC and the calculations you’re performing). In this post, I’ve created a simple function which finds the first N prime numbers (N is specified through the Editor). 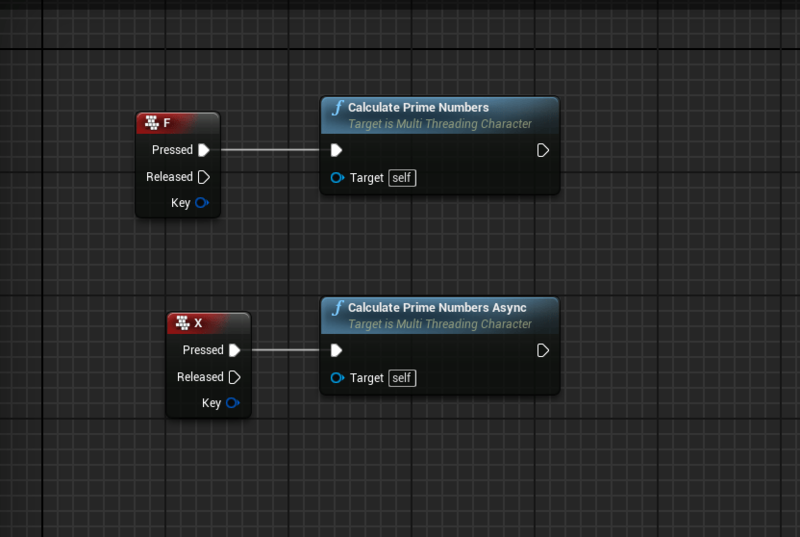 Moreover, I’ve created two inputs – one of them calls that function in the game thread, while the other one calls the same function in a different thread. Later on, we will add one more class inside the header file of the character but not inside the character’s class. We declared a namespace which contains the static function CalculatePrimeNumbers in order to be able to access the same function from different code classes. When it comes to multithreading, you will hear a lot about Tasks. To simplify things, a Task is a piece of code which runs on any thread. We are going to create a new class which will execute the CalculatePrimeNumbers function, in another thread. To add this class, we don’t have to use the normal Add a C++ Class workflow through the UE4 Editor. We will add our class by hand! So, which class are we going to inherit this time? Well, we need to locate a class that provides some built-in functionality, in order to create and use a Task. I’ve already searched the source code of the engine and located the necessary class for our case so you don’t have to worry! /*This function is needed from the API of the engine. Then, tell that Task to execute in the background. The FAutoDeleteAsyncTask will make sure to delete the task when it's finished. Compile and test your code! Don’t forget to edit the MaxPrime variable through your Editor to have similar results to the video demonstrated above! PS: In case you want to know more about Multithreading inside UE4, I suggest to locate the file AsyncWork.h inside the source code of the engine. I’m waiting for the Blueprints version…will this ever be possible in Blueprints only (no C++ at all)? Well I’m not seeing something on the UE4 roadmap so my guess is that we won’t see this in the near future. Considering the work that has been done in Blueprints so far I believe that a Blueprintable version of this post is do-able (technically speaking). Maybe an employee of Epic can provide you with a solid answer on that! Thanks for your reply. I really do believe Blueprints is awesome, but still very limited. Adding multithreading would simply take it to the next level, and as you’re saying, there’s no reason why it wouldn’t be possible from a technical perspective. In ue4 ,whether or not need us to consider c++11 feature like “atomic operation” ,“lock” and “competition” ? I haven’t explored if the engine uses that under the hood. So, if I can implement the features I want with the systems provided, I wouldn’t bother (unless something goes awry). It is much more longer and very different from this one. They are doing the same thing however: Finding prime number. I just got confused of what is the difference of two, could you clarify for it? Thank you very much!